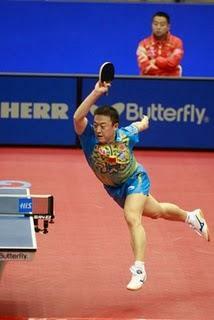 Ma Lin, born on the 19th of February, 1980 is a professional male table tennis player from China. Ma Lin current ranking is World Number 4 as of June 2011. Lin started playing tennis at the age of five years. He is known for wearing down the soles of his shoes only in three days. After that and became a member of the provincial team in 1990. It was only in 1994 that he joined the Chinese national team at the age of only fourteen years. It was then that he turned professional. He has bagged the four World Cup Trophies (2000, 2003, 2004, 2006) which is more than any other player in history but he has even lost three times in World Championship Finals (1999, 2005, 2007). Lin has often been criticized for his lack of mental strength. He crumbled down at the crucial moments a number of times. He was seeded first in the World Championship at Zagreb (2007); however he lost. However in the 2008 Beijing Olympics, Ma Lin won gold in both the singles and in the team competitions becoming the third player to achieve such a record. He holds a professional record of 5 major titles which includes the four major World cups and the 2008 Summer Olympic Games.